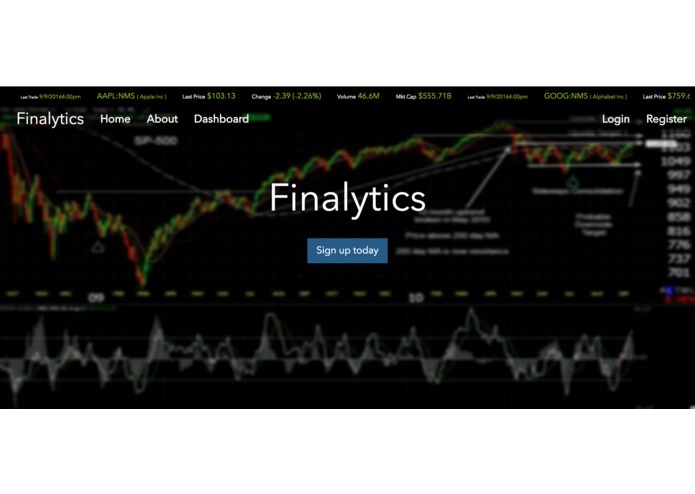 An all in one dashboard for financial portfolio visualization, analytics, and optimization. Received 2nd Place prize as well for Top Data Visualization from Qualtrics Inc. and two honourable mentions for best use of history in a hack and user interface. 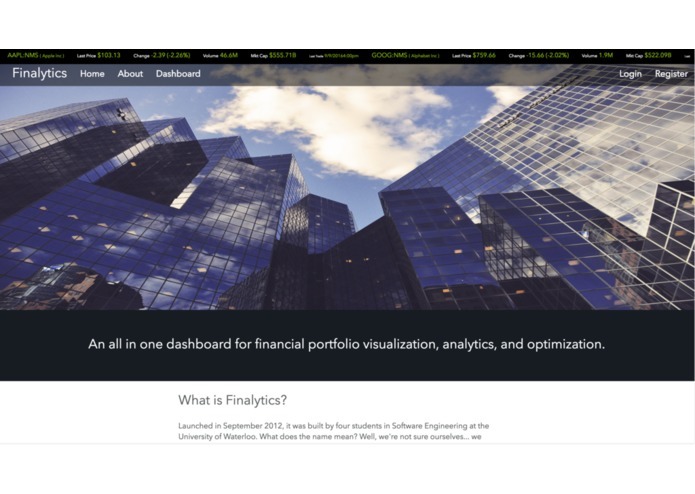 Finalytics is an all in one dashboard for financial portfolio visualization, analytics, and optimization. 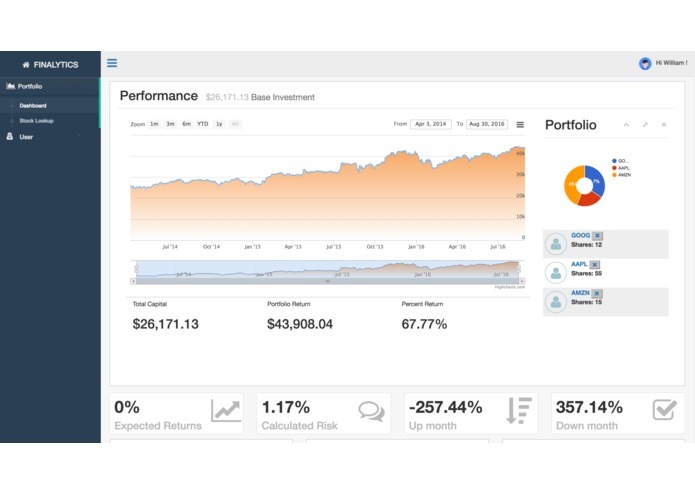 The platform makes it easy for anybody to see quantifiable data and how it impacts their investment decisions. 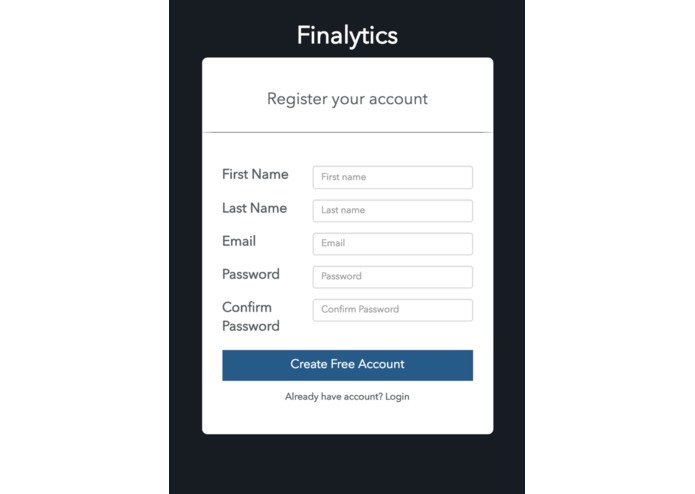 We built up Finalytics with a Python / Flask backend and React in the frontend. 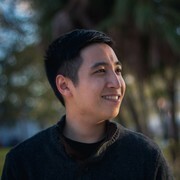 We were able to set up the visualizations by querying from multiple finance related APIs such as Yahoo Finance, NY Times, and Alladin API by BlackRock. The data and calculations given here were then put up with display on the dashboard for easy access and use in future insights. This was our first time using React. As such, we found it difficult to get comfortable with the framework. Also a multitude of issues dealing with Flask and our server. However, we made big progress by talking to the Hacker Gurus and Sponsors who helped us solve our issues. We built something cool that was finance-related and allowed users to view historical financial data in a new light (e.g. expected return on investment). When you graph a financial portfolio - it looks very cool. Also very fun to see how investing in a certain set of stocks in the year 2004 and the risk and return factor that was at play from the numbers provided by our API calls. Develop a more intuitive interface for the information we have integrated into our dashboard. Optimize the dashboard so that it may load faster. Integrate more of the Alladin API for financial calculations. Worked on full-stack. I implemented Yahoo Finance / New York times API to grab data pertaining to stock to finish stock search. I also built up the user login system / portfolio logic with Flask and designed landing/about/dashboard pages. 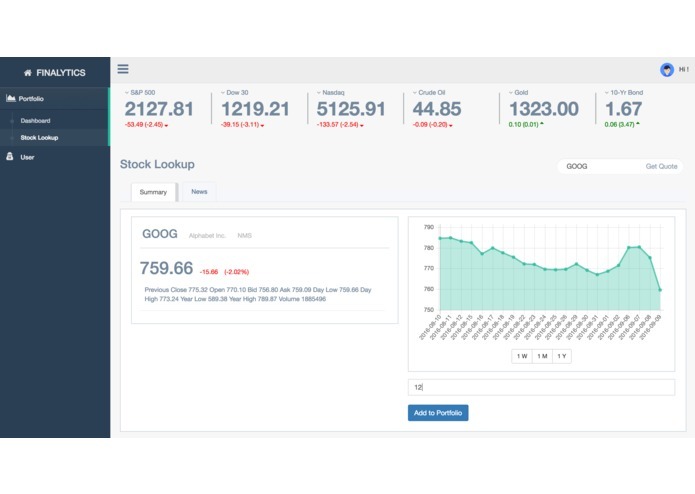 implemented Stock lookup page which consist of Yahoo Finance and NYTimes Ajax calls to grab data for stock searches. I also built up the user login system with Flask and designed landing/about/dashboard pages with William.